Keys have been with us for a long time. The ancient Egyptians were the first to secure their doors with keyed locks. The first instance of a lost key occurring soon after. Lock technology has always evolved. However, only recently did it become smart enough to ditch keys altogether. Thanks to smart home security technology, we can enjoy the keyless convenience. Giving us better awareness and control of who enters our homes. A smart lock gives you keyless access from its numerical keypad or from your phone. It offers smartphone alerts about who's coming and going. You can also set up automatic triggering of other smart devices like your lights and security system. You can unlock and lock it from your couch, your car or from work. It's easy to create a code for each of your kids, your dog walker, or a contractor who needs access. Unlike a spare key, you can easily delete a user code or give it an expiration date. With our updated Alexa skill, you can securely unlock your doors too, using a Secure Command and PIN. 4: Scenes automation. It's easy to include an Alarm.com-powered smart lock into a Scene, where a single command controls many devices. Our pre-set Away Scene, for example, arms your security system, locks your front door and closes the garage, giving you a smoother getaway from home. How do I get a smart lock? Upgrade your front door as part of a smart home security system from Gotcha Security. 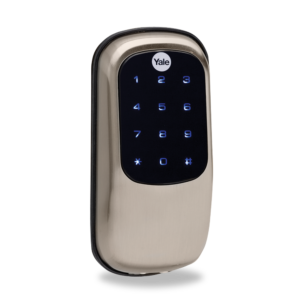 We carry a range of best-in-breed smart locks, built by trusted hardware manufacturers including Kwikset, Yale, and Schlage.